On Dec 23, the maritime rescue team from the Sanya South China Sea Rescue Department successfully rescued the fishing boat “Qiong Lingao 03068” out of danger in the southwest area off Sanya. All 7 fishermen on the boat were rescued. The fishing boat was working in the South China Sea when it was suddenly out of power after the propeller was tangled in the fishing net. And even worse, the tail shaft began have seepage. and the situation became very dangerous. After receiving assistance, the Sanya rescue base under the bureau dispatched a rescue vessel to rescue the trapped fishing boat. Braving five-meter-high waves whipped up by gale-force winds, the rescue vessel rushed to the location where the fishing boat was stranded. 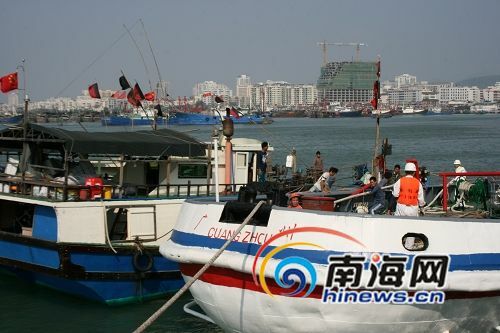 At 3 am on Dec. 23, they finally found the boat and managed to drag the boat return to Sanya port.